With an integrated ThingMagic UHF EPC RFID multi-protocol reader/encoder, Zebra’s R110PAX4 supports all variants of EPC Class 1, Class 0, Matrics 0+, ISO 18000-06B and Philips UCODE 1.19 transponders. The reader/encoder’s unique architecture allows for remote software upgrades for new protocols, offering solid investment protection for your RFID initiatives. Withthe ZebraR110PAX4 print engine, print-and-apply systems can become RFID enabled without significant mechanical modifications. Offered in both right- and left-hand versions with 203 or 300 dpi, the R110PAX4 offers enhanced RFID processes for fastest throughput. The RFID calibration feature automatically selects the program position for optimal transponder placement, and RFID counters keep trackof goodand unusable labels. 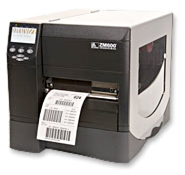 The R110PAX4 also offers XML-enabled printing. Zebra’s best-in-class Z Series printers just got better! The ZM includes additional productivity-enhancing features and modern, flexible network connectivity for easy system integration in most manufacturing, warehousing and business applications. 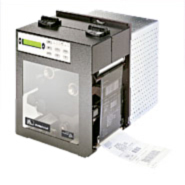 This industrial/commercial workhorse also delivers efficient 4-inch (ZM400) and 6-inch (ZM600) wide labeling thanks to its quick throughput and 10 inches-per-second print speed. The ZM offers a multitude of options including 600-dpi (24 dots/mm) resolution and design enhancements make this new-generation Z Series printer even easier to operate, load, and maintain.